Most people never heard of Toronto-based SurfEasy until it was snapped up in early 2015 by browser maker Opera. Even if you’re still unfamiliar with this VPN, you might have used it: SurfEasy powers Opera’s free VPN built into its browser, as well as the free VPN apps for Android and iOS. On top of all that free stuff, SurfEasy has its own paid VPN service separate from Opera’s free offering—according to a company rep, there’s no overlap between the two. SurfEasy with an active VPN connection. SurfEasy’s Windows desktop could use a little design work. The Windows desktop app exists only in your system tray. To open SurfEasy you click on the icon and the interface pops up in the lower-right corner of the taskbar. When disconnected, SurfEasy shows your location based on your IP address, and when you are connected it shows your apparent location based on your VPN IP. To change your VPN location click the flag icon in the upper-right corner. This reveals a list of all the various country locations you can choose from. SurfEasy offers two different paid services: Total and Ultra, which determines the The number of countries you get—16 and 28, respectively. It’s frustrating that the SurfEasy Windows app can’t be moved from the lower-right corner, which is already a hub of activity on Windows 10 PCs thanks to incoming notifications. One of SurfEasy’s top features it that it works with U.S. Netflix, and reliably so. During my time with the VPN I never had a problem using an American server and watching video on the premium service. The company seems to be focused on improving its country connections and server count rather than offering a bunch of added features and services. 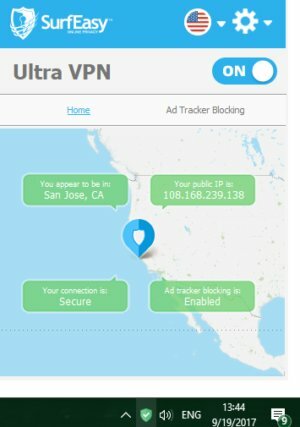 SurfEasy automatically blocks ad tracking, and it offers a feature that automatically connects to the VPN when on Wi-Fi—not uncommon among VPN providers. SurfEasy’s automated connection feature is fairly indiscriminate. It automatically connects to the VPN over any Wi-Fi connection versus only over open networks where no encryption or significant protection exists. SurfEasy permits torrents but only as part of the Ultra package. The only critical setting that SurfEasy’s app offers is whether to activate the VPN app on startup. SurfEasy allows you to use up to five devices simultaneously, and there are apps for Windows, Mac, Android, iOS, as well as proxy extensions for Chrome and Opera. SurfEasy costs $48 or $88 per year depending on the plan you choose and offers a 7-day money back guarantee. SurfEasy is now the fastest VPN service we’ve tested displacing former speed champ Mullvad. In our tests, SurfEasy was fast across all the connections we tried—U.S., UK, Germany, Japan, and Australia—dropping to just 55.28 percent of the base speed. That is a tiny drop when most services are dropping down to about 33-35 percent overall. Keep in mind, however, that your experience with SurfEasy—or any other VPN—may vary depending on your ISP, router, device, and connection type. The one quibble I have with SurfEasy’s performance is that at times the connection stalled for a few seconds after the app connected to a new region. To sign-up for SurfEasy requires an email address, and those who wish to could use a pseudonymous email address. That won’t get you very far in terms of anonymity, however, as SurfEasy does not offer any significant way to pay anonymously or semi-anonymously. All payments are handled via a credit card or PayPal. There are no options for paying in cash or with cryptocurrencies like Bitcoin. SurfEasy said it offered Bitcoin at one time, but usage was too low and at the time Bitcoin was inconvenient since you couldn’t charge customers monthly. The company says it might think about re-introducing Bitcoin in the future. SurfEasy’s business address is 488 Wellington St. W., Toronto, ON, Canada, which is listed on the company’s website. The company’s leaders are listed on the site as co-founder and CEO Chris Houston, and co-founder and CTO Athir Nuaimi. There are also 41 SurfEasy employees listed on LinkedIn, most of whom are in Toronto or the surrounding areas, suggesting that the bulk of SurfEasy’s workforce is centrally located in a single office. SurfEasy does aggregate bandwidth usage for various purposes including billing, network operations, and support. In fact, the company may suspend your account for using an unusually high amount of bandwidth. It may also have to look at your activity during a customer support call, but that data is logged long term. SurfEasy says it also uses an automated network traffic management system that requires “real-time analysis” of traffic that includes destination websites and originating IPs. No logs are maintained of this activity, however. SurfEasy is not the VPN you want to use if you’re are interested in being as anonymous as possible. Primarily because when it comes time to pay you can only use standard forms of electronic payment, which are easily traceable. If all you’re looking for is a good connection to watch Netflix or carry out other high-bandwidth activities on a solid VPN connection then SurfEasy comes highly recommended. SurfEasy is a very basic VPN with fast speeds that can get past Netflix's VPN restrictions. The company's Windows app could use a little work, and there is no easy way to pay anonymously for those who need it.